In a few hours the class of 2017 of The Bull Runner University will officially run their first (or second) marathon and a small part of me (yes, there is a small part of me) is sad that I won’t be a part of it. 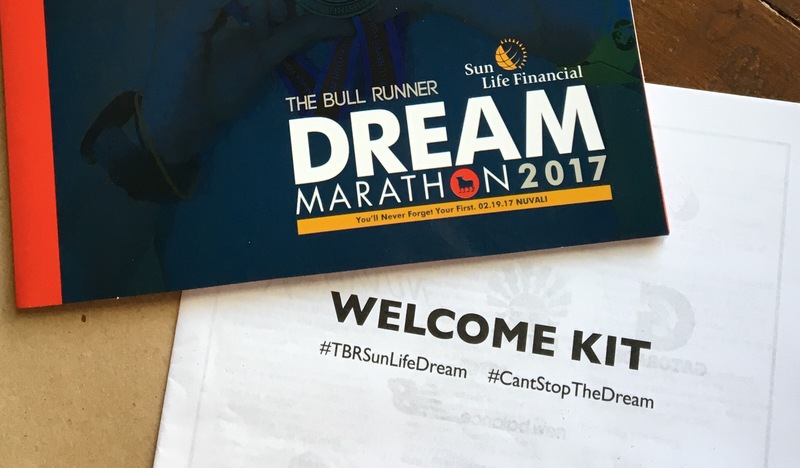 I signed up for the TBR Dream Marathon back in August. The motivation was laughable and shallow, although I don’t include it in my reasons why I’m not joining the event. I was wait-listed and then got in in a space of two days, paid the fee the next day, and the week after that, I started going to the office gym. It was a very good start. The next weeks saw me in my regular running routine. Pikit-mata, I invested in a Garmin and in more decent workout clothes — before that, my “workout” clothes were the free singlets from the races I joined in years ago. I read on techniques and training schedules. Like many first-timers, I worked on my stability and endurance and planned on my speed next. I did not get to the focusing on my speed this time! part because, well, my routine started crumbling down. Before it did, I managed to run one 16km and one 22km. Slow but nonetheless successful. My biggest achievement there was not feeling overly exhausted — hey, I was sllooooowww) and was able to go to work the next day as if nothing happened. On the first week of December, I got acute gastroenteritis (that SM Aura restaurant and their lousy handling of greens was my culprit, haha) and was unable to train for a week. After that, the holiday season was in full swing and it was also a busier time at work, so I didn’t go back to training. In hindsight, they were all excuses. Then January came. I could have gone full blast in training to make up for it, hey I even found a shortened training calendar leading up to February 19, but the momentum came crashing down. It was disheartening but it was a battle I was sure I already lost. I paid for runs to cover long distance training for January and February, but had to sell them. Good thing I was able to! Sayang din yun pera, ha. Then just when I thought I was just extremely undertrained, and perhaps, I can still go and run on marathon day (the cutoff was 9 hours after all! ), I was faced with a more serious medical emergency that totally put my marathon plans off the table. I was even scheduled sana to join a mountain hike so as not to feel bad for missing the marathon but even that was prohibited. My take is I am really not meant to do any physical activities during this period. Anyway, I know it’s not going to be the only opportunity to run 42km. If the chance presents itself, I know I’m not going to be a total noob anymore. I did not regret the time and money I spent in the past months, even with a whisper in some hidden space in my heart that I won’t be able to do it anyway. In fact, one of the things I miss is the great feeling after working out. I thought that sluggishness was endemic in my system but apparently it’s not! Hahaha! If only for that as a basic motivation, it might be great to poke the territory again. For now I can only wish that all the marathon dreamers finish strong and safe. I was witness to the amount of hardwork and dedication they had. The friendship they formed is also something to be proud of. Perhaps someday, I’ll meet them, and it would be nice if it’s at a marathon route. Let’s see!